I am an internet online homebased business coach. Yes I work from home and I love it! Let me tell you something right now…whether you believe it or not, you are amazing! You have awesome potential. Awesome opportunities are waiting for you inside this website. 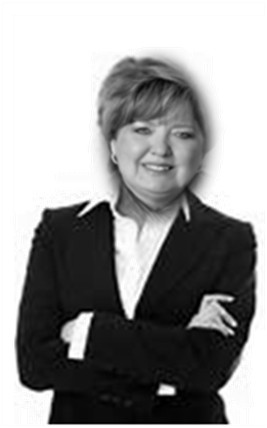 I am a Certified Financial Planner, CFP®, and a Certified Business Coach. I chose financial planning because I wanted to learn everything I could about how money works. I chose business coaching because I wanted to help small business owners 2X, 3x and 10X their business profits. I owned a successful financial planning practice for seventeen years. Money was never a problem, but I had no time to enjoy the fruit of my labor. When I lost my home, my business and my livelihood in a painful divorce, I decided to launch my online business to fulfill my inner calling. I was at a time in my life when it seemed that everything I had done was a preparation for the main event which was still to come. By choosing to uncover my life purpose I knew I was making the choice to transition from my former life as a wage-slave to the position in life where I could work when I want and where I want. Fast forward to today, I spend most of my time creating, writing and coaching in my home office wherever I choose it to be. Losing everything I had worked for shattered my confidence and forced me to face some tough questions. A quote I remembered from Jim Rohn started my turn around. Once I accepted responsibility for my fate, I was able to confront my fears head on and think more clearly. Am I loving myself and others unconditionally? Am I truly loving God, loving myself and loving others unconditionally—without reservation, without judgment and without hypocrisy? If I am, I must forgive and commit to a life serving others. And, I must commit to taking care of myself, spirit, soul and body. Am I living my life to the fullest? Am I fulfilling my destiny and using my gifts fully? Am I directing my energy and using my influence where it will do the most good? If I am, I will enjoy abundance, soul-peace and prosperity as I serve others. Am I making a difference? Am I making a positive impact on my family, in my community and in the world? If I am, I will be fulfilled and I will be at peace with myself and those I serve. I encourage you to ponder those questions for yourself. Love yourself unconditionally, live your life to the fullest and do all you can to make a difference in life. How you answer to those three questions is the key to your success in life. It took me a few years to climb back up to an enjoyable life. I share the experiences I have had and the wisdom and knowledge I gained openly and honestly with you in the hopes that you can find your life destiny and fulfill your life desires. I went from being $67,000 in debt to the position of financial independence I enjoy today. It wasn’t easy. It took work and sacrifice. I had to cut back on my expenses, stop my dependence on credit cards and dramatically increase my income. I’ll show you how I did that but I won’t promise you riches and overnight success. The path to financial freedom is a journey. It takes work and sacrifice. 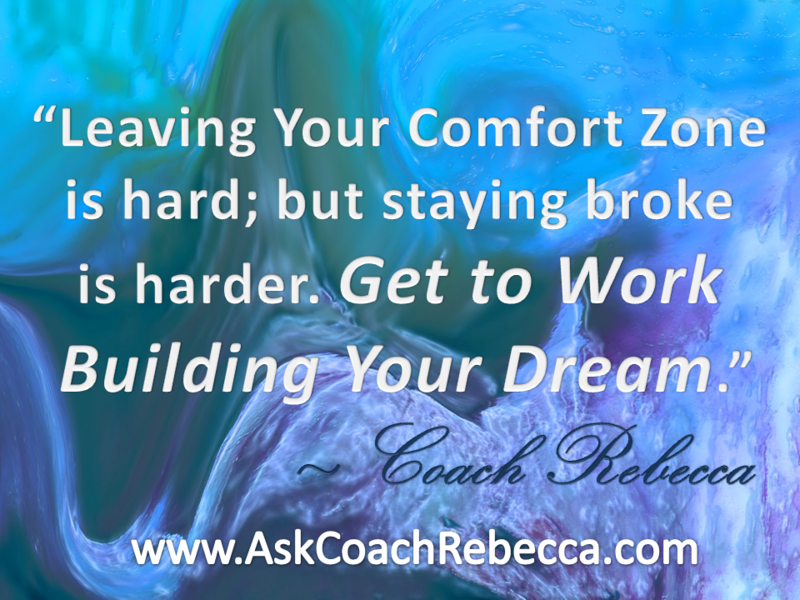 You have to be willing to move out of your comfort zone. Moving out of your comfort zone is hard but staying money poor and time poor is harder. I hope in time you will trust me to help you create a Time Rich Money Rich Business From Home™. My passion is helping women transition from a life of worry and stress to financial freedom. Helping You Do More of What Makes You Spectacular! But, my passion for helping people become spectacular is what energized me to become and internet homebased business coach. 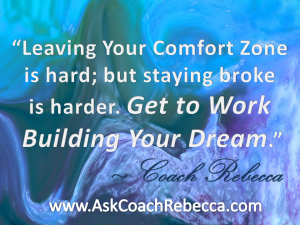 Sign up for your FREE BREAKTHROUGH COACHING SESSION and learn how you can start living the life you have always dreamed about. I Believe In Your Success! 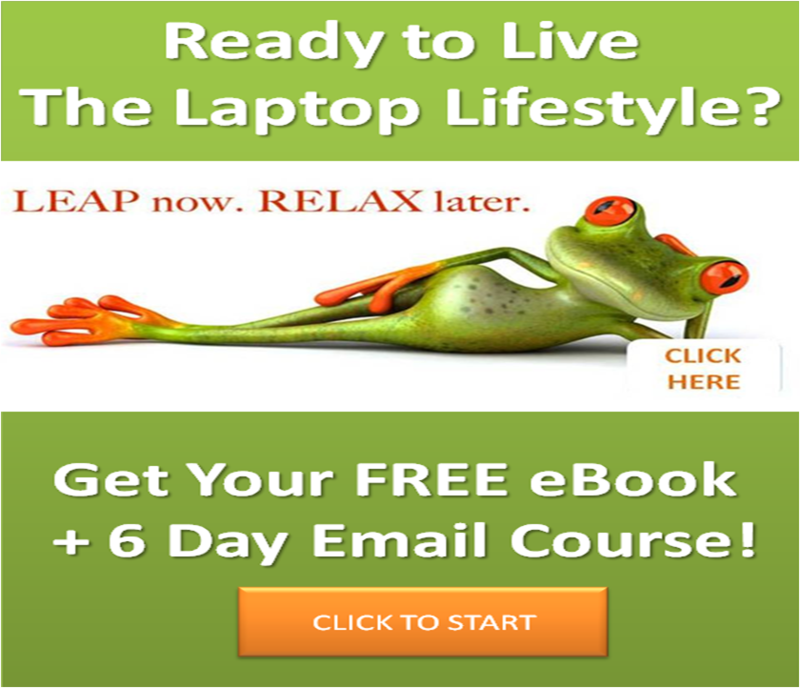 Ready to create your own Time Rich Money Rich Business From Home? StartHere.